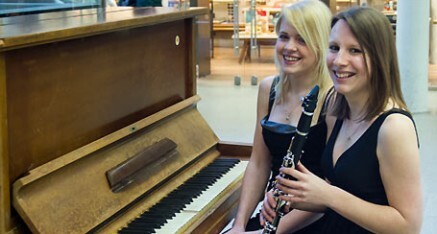 Sarah Douglas and Amy Wakefield are a clarinet and piano duo, originally from Hazel Grove in Stockport. They have performed together since childhood as they attended the same primary school and Chetham’s School of Music. As a duo, they play in recitals around the UK and as guest artists for international cruise contracts. Recent concerts include a recital at the Buxton Opera House Arts Centre and upcoming projects include trips to Australia, New Zealand and the USA. Sarah studied at the Royal College of Music where she won the Henri Selmer Paris Clarinet Prize and the Stephen Trier Award. She was supported by the Anne Driver trust, a Neil Vint Bursary and won a Philharmonia Orchestra Martin Musical Scholarship. She has worked with The London Philharmonic Orchestra, The English Chamber Orchestra, Royal Ballet, KZN Philharmonic (South Africa), Brit Award winner Duffy and has played on BBC Radio 3 and Radio 1’s Live Lounge. Sarah plays regularly with OperaUpClose, who recently won an Olivier Award for Best Opera. She is a founder member of 11 Collective and Session Solutions who provide live instrumentalists and virtual tracks for bands and composers. Sarah runs interactive concerts, workshops and community projects through Live Music Now and also works as a peripatetic instrumental teacher and ensemble coach. Amy received a scholarship to the Birmingham Conservatoire and went on to study with the Head of Piano, Malcolm Wilson and Victor Sangiorgio. She now works as a repetiteur for opera, ballet and musicals and is the pianist for the ‘Lydian Singers’ of Knutsford. Amy works for the Hammond School, Royal Academy of Dance and has played in Nutcracker workshops on the Isle of Man and for exams around the North West. As a solo pianist she has performed in concerts and masterclasses with Murray Mclachlan, Peter Donohoe, Margaret Fingerhut and Bernard Roberts and has recorded with the composer of MicroJazz‐ Christopher Norton. Amy also plays the violin in a String Quartet and performs with string orchestras around Cheshire. She has a PGCE in music education, teaches privately and as a peripatetic tutor.